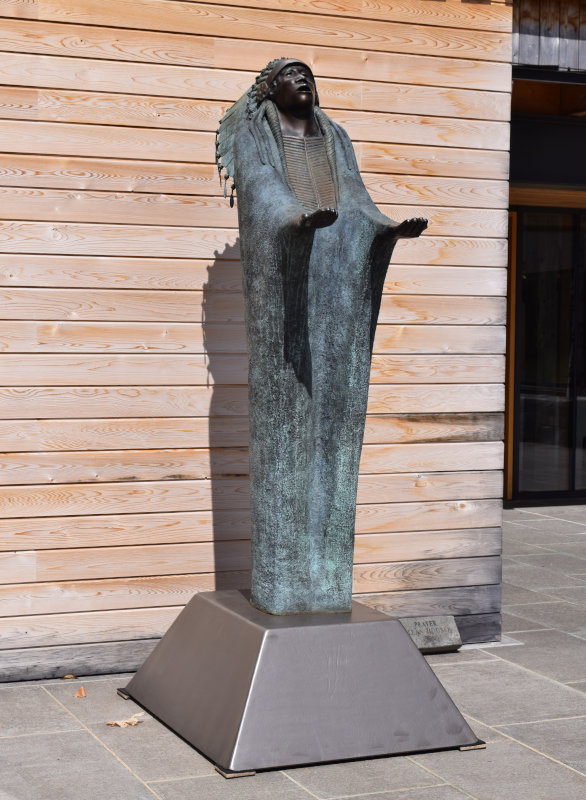 This sculpture is located inside Alnoba and may only be viewed when building is open for public events. This sculpture is unique. Atchugarry’s work is based on the principal that a material’s natural beauty is enhanced if the form remains simple. This simplicity is created through variations on linearity, while always avoiding straight lines, Made from olive wood, a symbol of peace and health, Atchugarry combines both medium and form to create his powerful composition. 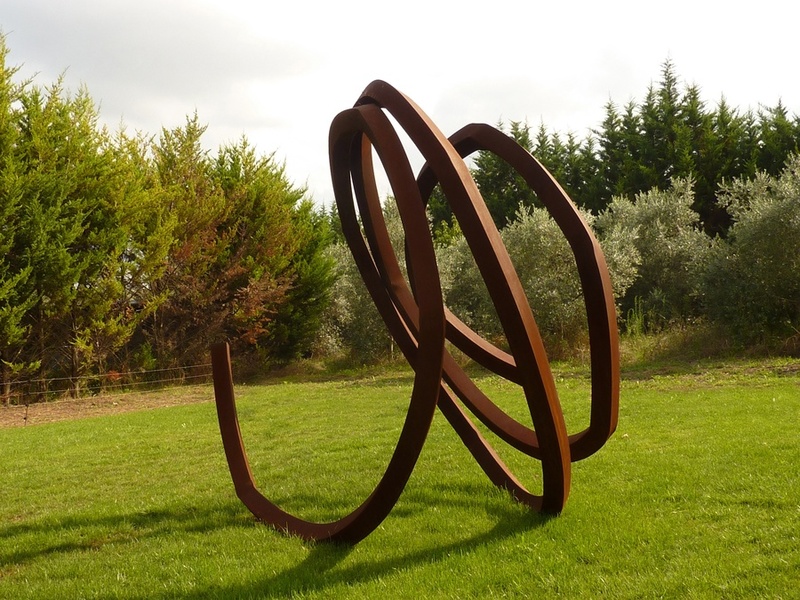 Pablo Atchugarry is a Uruguayan artist, best known for his abstract sculptural art. For each sculpture, Atchugarry personally selects an appropriate block of marble. He works with white Carrara marble from Tuscany (the same type of marble that the David is famously carved from). There is no ideal view from which to observe this sculpture. The viewer can enjoy each piece as a whole and contemplate how each of the forms work together. 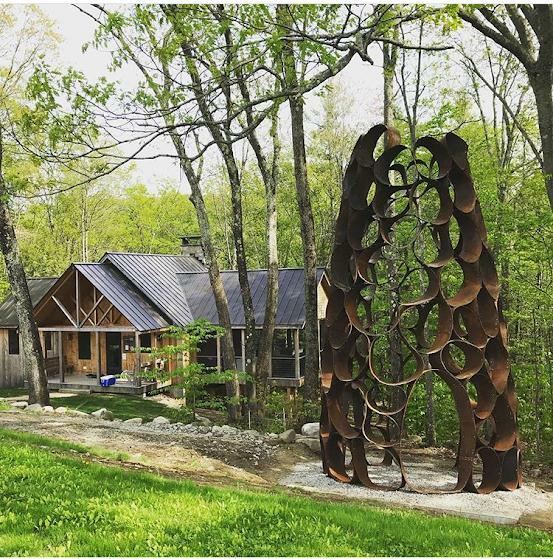 The artist utilizes sinuous curves, folds and openings that evoke plants and trees, waves, fire and the human figure. 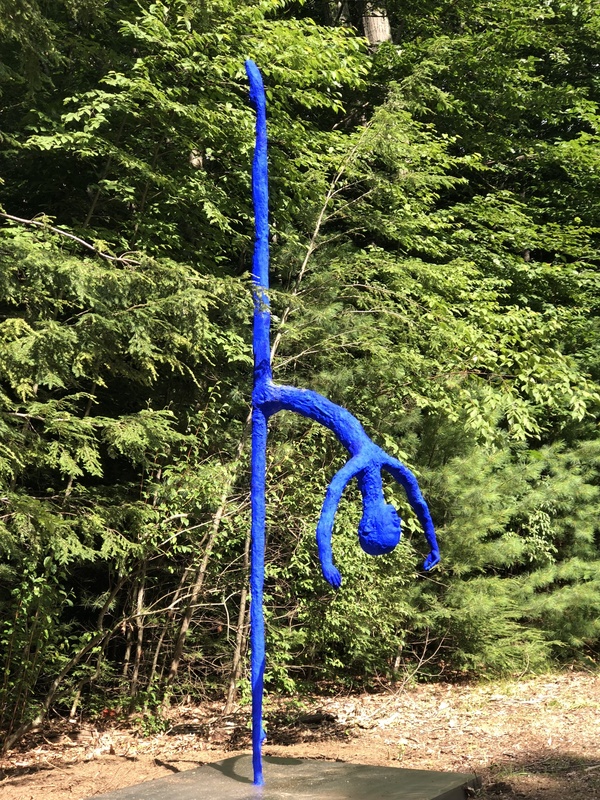 His sculptures are both figural (referencing the human) and abstract. At the age of 7, Doner came upon a Venetian grotto chair in Florida. This observation taught her “that furniture doesn’t have to be mundane.” She creates furniture as works of art, which are tied closely to mythology and celestial surroundings. Ice Ring represents the ice rings found around Saturn as captured in photographs by the space craft Voyager. 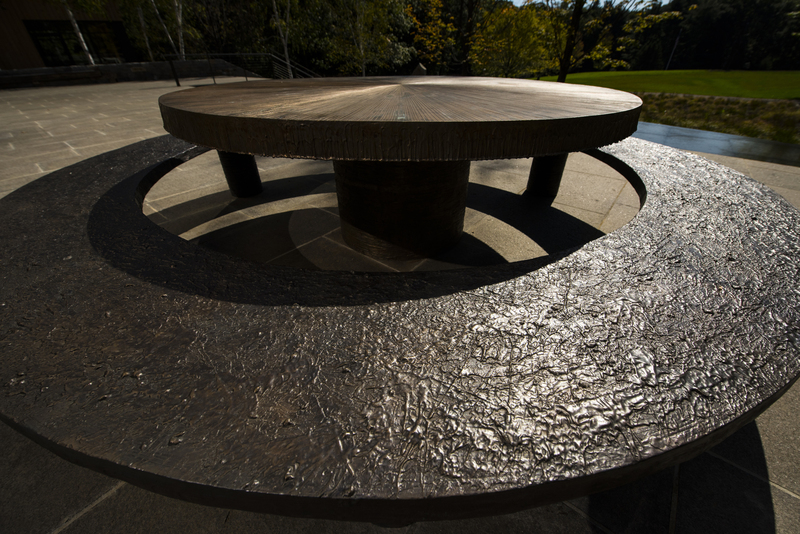 In the center is Radiant Disk, incised with radial marks that attract and channel light. The difference in surface treatments of the two works contrast references to the coldness of Saturn’s ice rings with the bright, warmth of the sun. Her work is fueled by a lifelong study and appreciation of the natural world, from which she derives her inspiration. 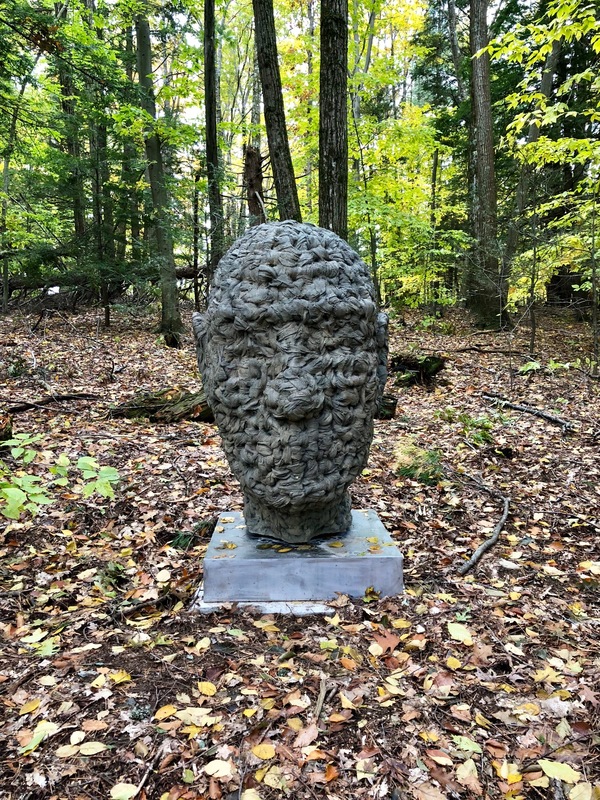 This sculpture is unique and site specific. Orly Genger is best known for creating large-scale installations from oils of rope, like this piece, “Going, going, gone”. 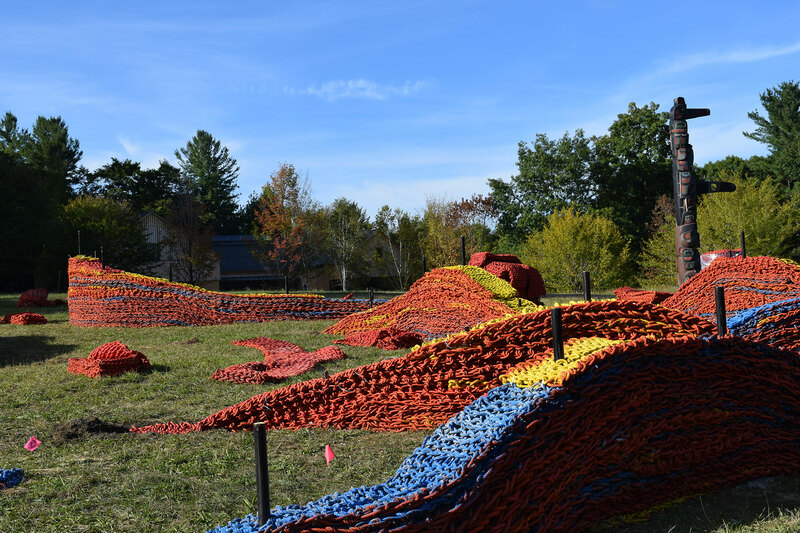 This monumental rope installation is made from recycled lobster rope and is painted in a bold red color. The sculpture is made by hand-crocheting the rope, which required Orly Genger and a team of assistants to first clean the lobster claws and fish bones out of the role and then crochet into strips. Speaking about her artistic practice, Genger said, “I was really drawn to working with my hands. It was more about using my body as the tool and having a direct relationship with the material.” These red strips evoke waves or flames that move across the landscape. We encourage guests to run their hands along the rope and walk through the different rope pieces. Andy Goldsworthy is a sculptor, photographer and environmentalist who produces site-specific sculptures and land art in natural and urban settings. The materials used in Andy Goldsworthy’s art includes mud, pinecones, snow, stone, twigs and water. Watershed Boulder is located in a steep, north-facing wood. During winter, the wood stays below freezing, even when the snow-covered field above thaws. 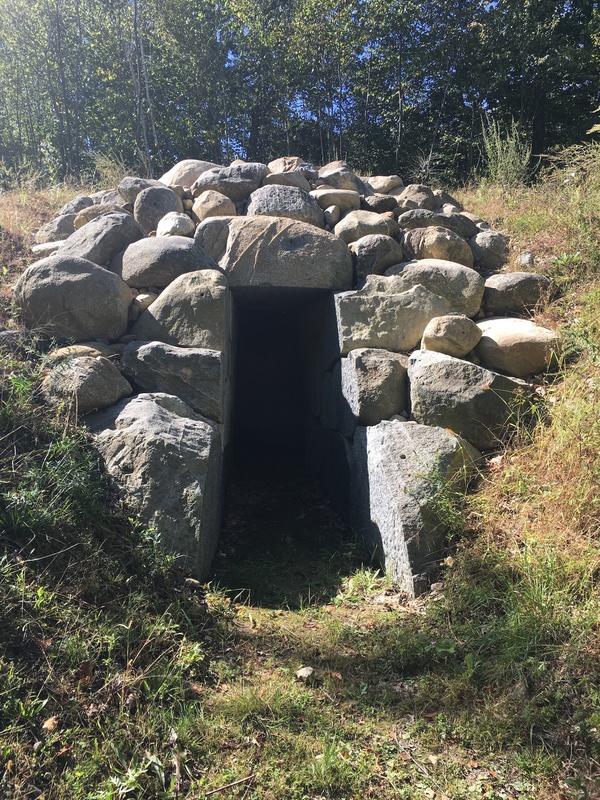 Drains laid in the field collect and direct water through the wood and into the work so that it falls and freezes upon the glacial boulder at the center of the wall. 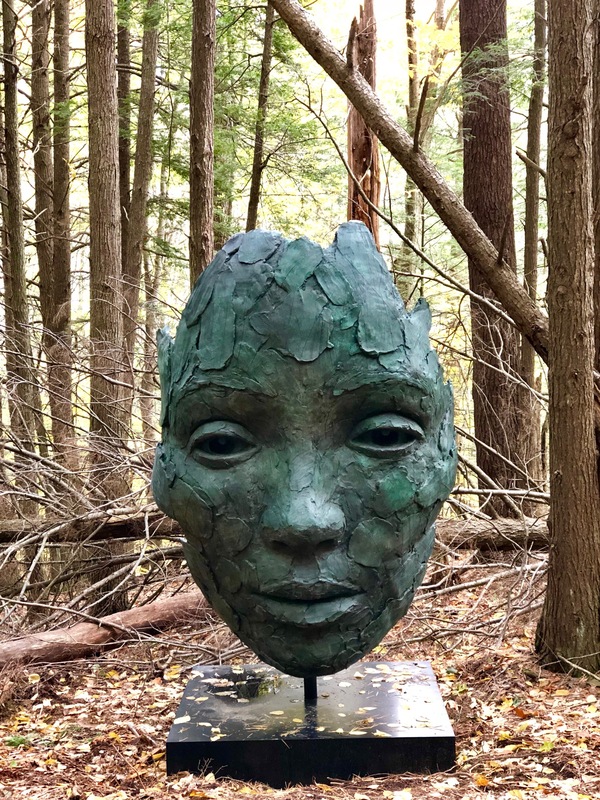 As the season changes, so does the sculptures interaction with the surrounding nature. In spring moss grows on the boulder, which dries up in the heat of summer. In winter, icicles and other ice formations appear with the snow and then thaw. Calvin Hunt works within the traditional Northwest Coast Kwagu’l style of totem pole making. His work reflects the diversity, spirituality, transformation and meaning of the Kwakwaka’wakw culture. 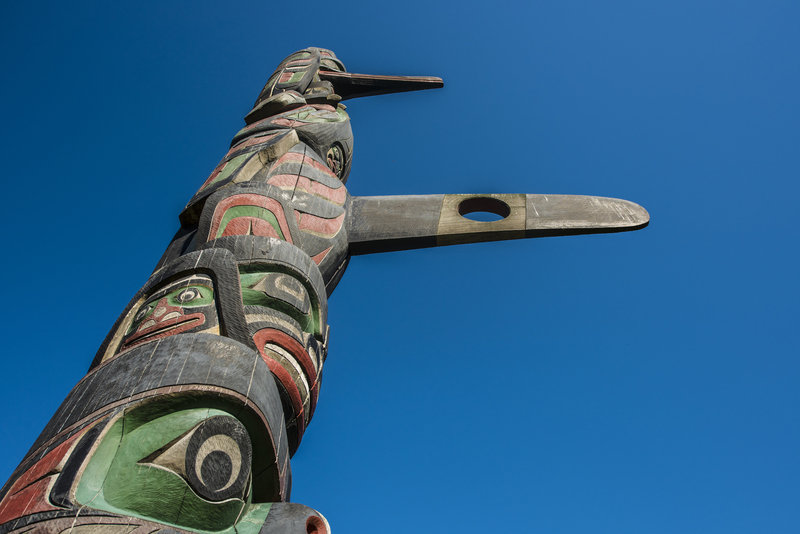 The subject of this totem pole includes a Raven, Killer Whale, Seal, Grizzly Bear and Salmon. Intermingled with design elements and colors, the carved totem pole represents the unifying symbolism of various animals and legends, which Hunt has learned from the teachings of his Chiefs, Elders and other artists. The Indigenous peoples of the Pacific Northwest Coast are the pre-Columbian inhabitants of the Pacific Northwest Coast. Spiritualism, the supernatural and the importance of the environment play integral roles in day-to-day life. 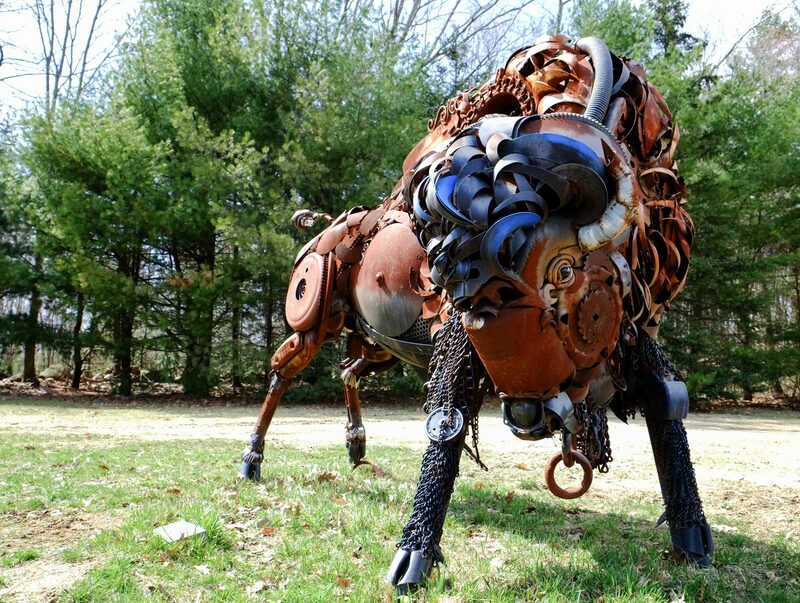 John Lopez creates sculptures that are welded from scrap metal that he sources from junk yards in his native South Dakota. 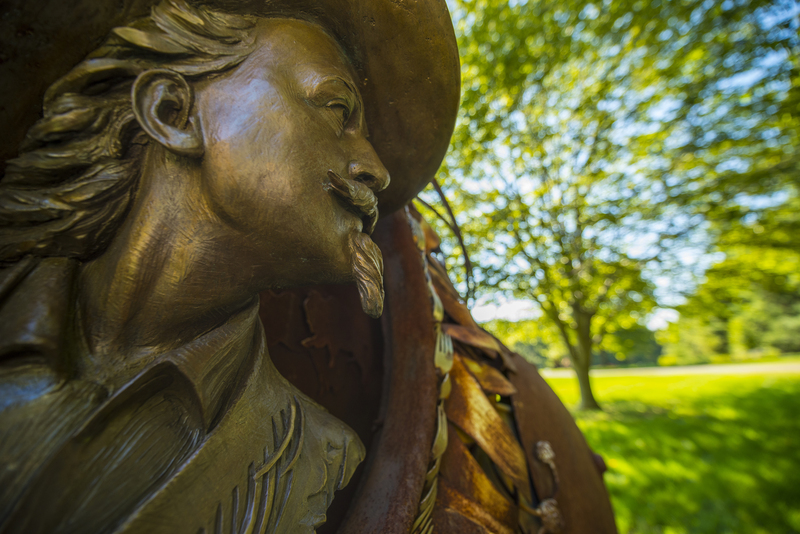 Born and raised on a ranch in Western South Dakota he started his career working in bronze and depicting traditional western and rodeo themes. It was later in his career that he started utilizing scrap-iron and sculpting with it. 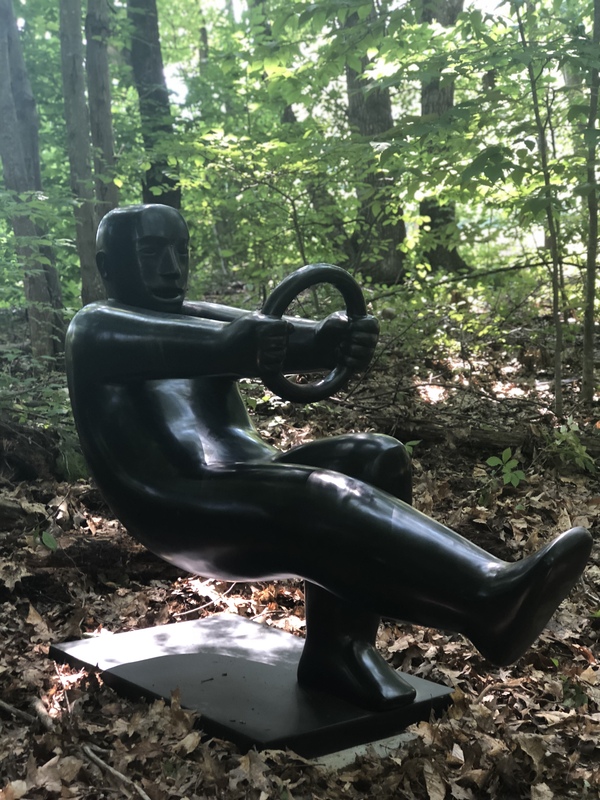 The more you look at the sculpture, the more that these found objects reveal themselves – the viewer realizing they are looking at utilitarian objects like forks, shovels and rusty car parts. 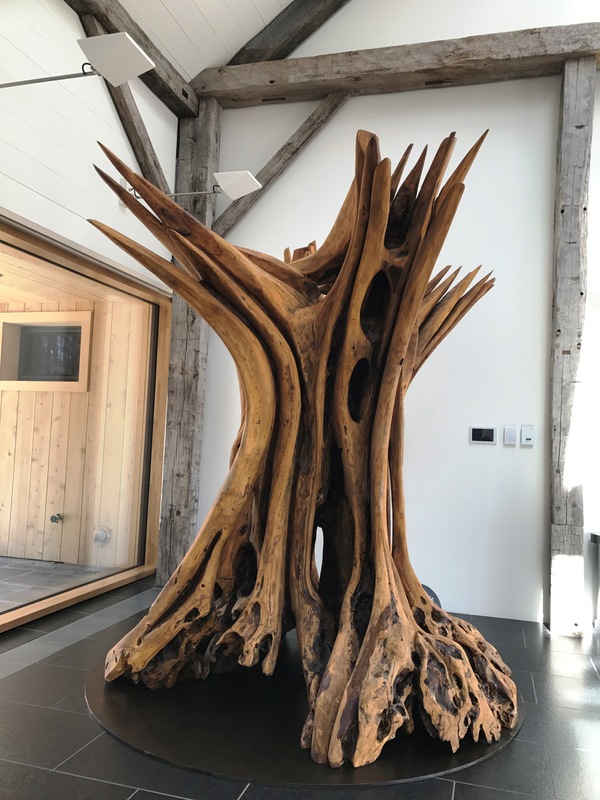 Reusing what would be in a junk pile and turning it into art is perfectly aligned with Alnoba’s interest in sustainability. Ernesto Neto is a contemporary Brazilian artist who creates large-scale environments. He often works with stretchy, stocking-like fabric in vibrant colors and suspends from ceilings and walls to create spaces where the viewer can enter. 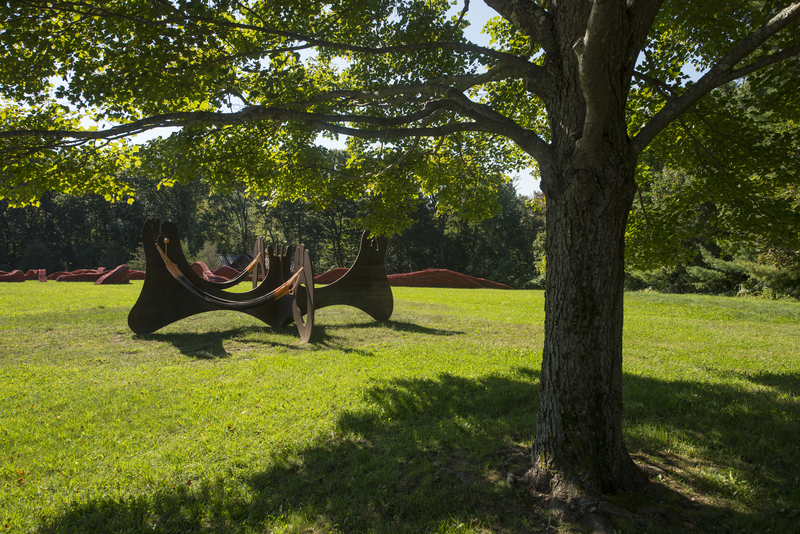 This sculpture encourages the viewer to relax in one of four hammocks and look up into the sky, enjoying the green palm fronds that can enable the escapist vacation from reality. We encourage our visitors to lay in the hammock and enjoy the sounds of nature. “Language is like a road, it cannot be perceived all at once because it unfolds in time, whether heard or read” writes Rebecca Solnit in Wanderlust, on the history of walking. However long the road might be, language however, may not be the way to understand complex situations. Sometimes we have to walk the road, circumvent conscious thought, and walk ourselves into understanding beyond language. For centuries philosophers have written on the value of walking, from Rousseau’s reveries to Kierkegaard’s daily health walks. Today we see walking increasingly as a political act, from collective gatherings to solitary meanderings, our bodies are compelled to walk as an act of resistance. In this group of objects, the walking stick offers a point of departure. 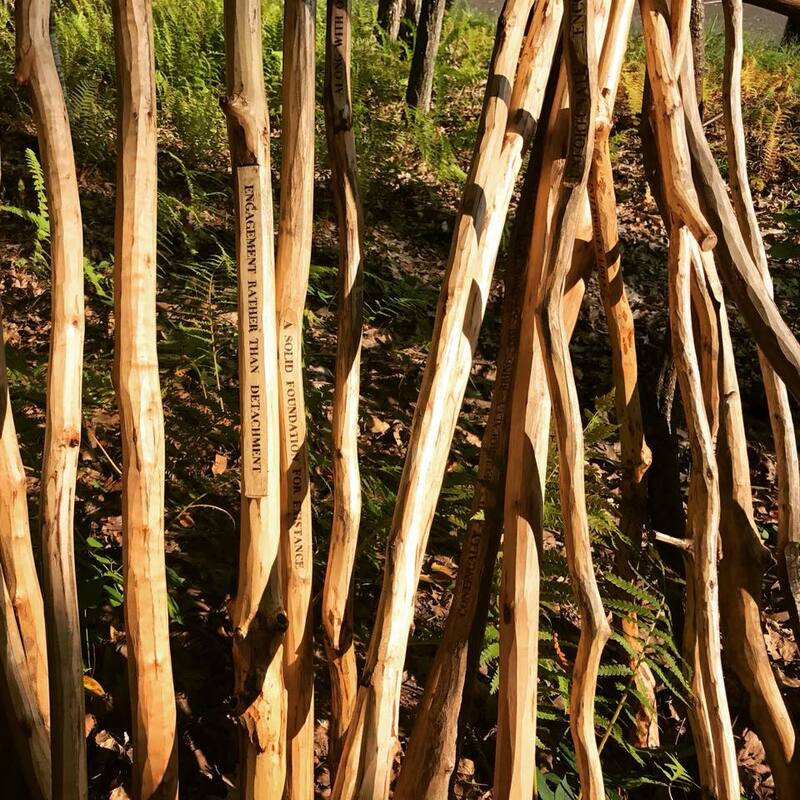 An array of walking sticks engraved with text fragments from Scottish anthropologist Tim Ingold’s essay on animism*, lean against the walls, asking to be brought out for a walk. At one time, the woodland in which Boulder House is now situated was cleared to make way for pasture. The task of clearance was never completed, leaving what must have looked like a battlefield, with mounds of earth where trees had been uprooted. Over time, self-seeded black-and-white birch trees have recolonized the area. The glacially deposited boulder at the center of the project was found partly buried. Once excavated, the boulder turned out to be larger than anticipated and as a result the scale of the project grew. The boulder itself was not moved at any point during excavation or construction of the dome. 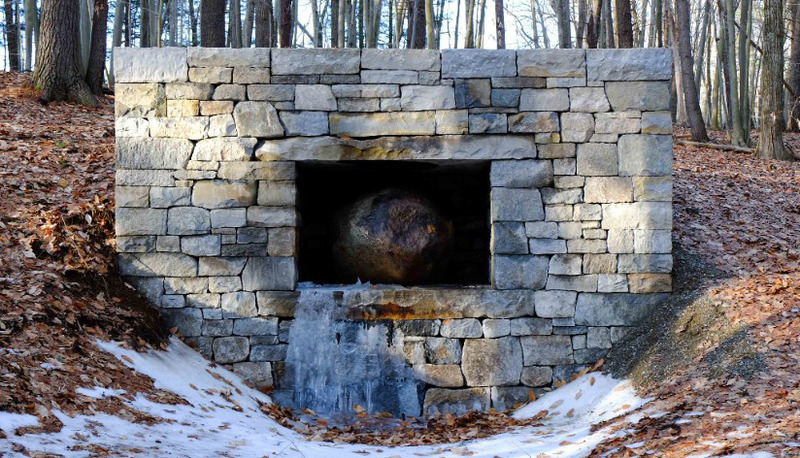 Boulder House was the last of a triptych of works, including Watershed Boulder and Passage, made with granite boulders. It was initially intended that the dome be made of quarried stone. The experience and understanding gained in the making of Passage made it possible to use boulders instead. DeWitt Godfrey is an American sculptor best known for his large, playful, rubber band-like sculptures constructions of banded steel. He is an Associate Professor in the Department of Art and Art history at Colgate University. Up and Away is sited to draw visitors across the main field to a network of trails that lead down to a stream below. This tapering form rises over 20 feet high and its double doorways lead you down a hill and into the wood. 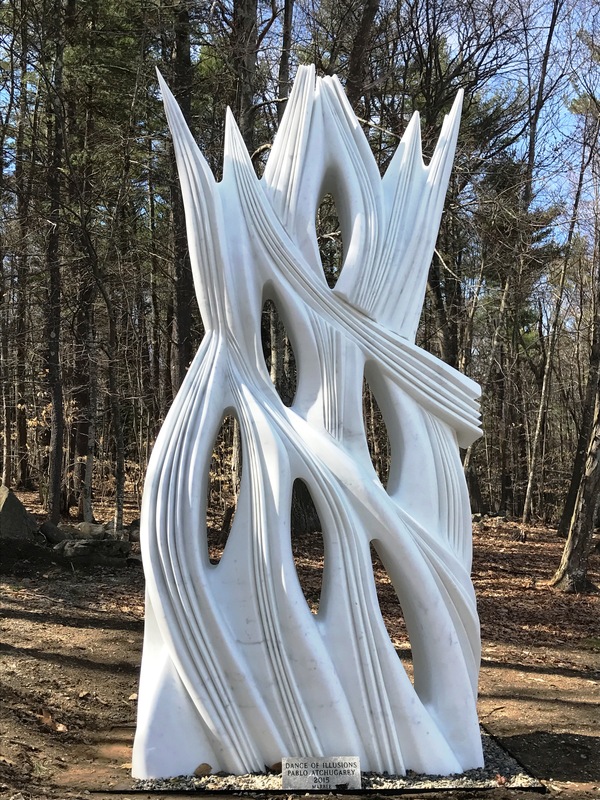 Traditionally working in a horizontal format, this is his first “vertical” piece that encourages visitors to look up into the sky and trees. Beezy Bailey aspires to create art as a balm for a mad world – a corrective for our most lamentable human qualities, including a planet brutalized by extremes. Many of his works emanate from his concern with Anthropocene, the present epoch characterized as the time in which the collective activities of Homo sapiens began to substantially alter Earth’s surface, atmosphere, oceans, and systems of ecological recycling. Bailey has a history of close collaboration with other artists, most notably David Bowie, Brian Eno and Dave Matthews. Beezy Bailey is a South African artist who works in a wide range of media including painting, sculpture, drawing, printmaking and ceramics. Bailey’s works are often accompanied by poems. 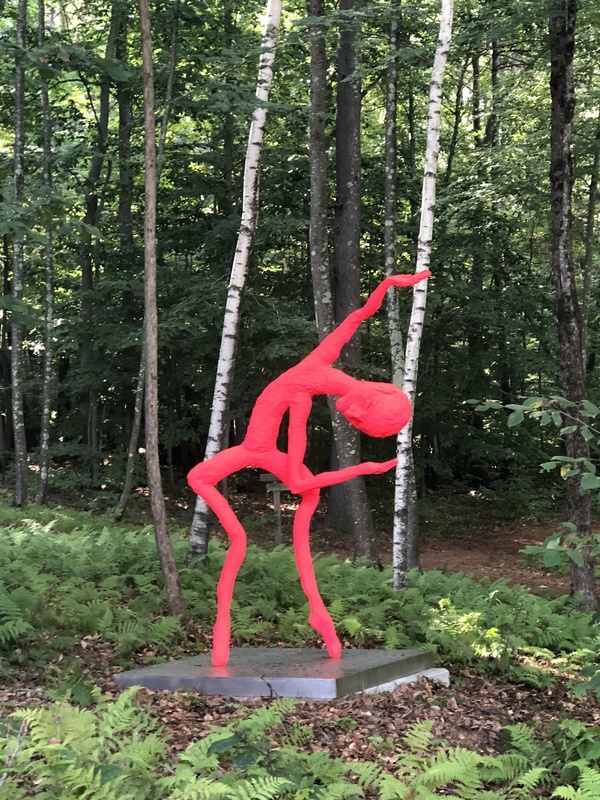 This sculpture is connected to his poem, 1000 Year Dance Cure, in which he urges the world to dance a new dance, to abandon that which does not serve us, and to embrace each other in our humanity, and the Earth in her service to us. An ambitious and lofty concept to be sure, Bailey, has always aspired to creating artworks as muti (a balm) for the heartache that exists in this world. In Hard Drive, Wozniak achieves the delicate balance between playfulness and elegance, a tension he strives for in his work. The surrounding vehicle has been stripped away from the driving figure. Un-phased, our subject accelerates (or slams the brakes?) with a determined assurance. This highly-finished surface and distilled form shows a figure who has morphed into the sleek forms and lines of their speeding car. Anthropomorphic animals like this exaggeratedly rotund and massive Gorilla are central to Brett Murray’s work. He began working on this theme in the 2006 exhibition, “Sleep Sleep” where a smaller version of the Gorilla was created. Reflecting on the conflicts that often come out of religious fundamentalism, Murray is interested in the concept of the “Other”, as manufactured through populist fear-mongering. Murray utilizes the Gorilla as a metaphor for the “Other”, physically representing and then humanizing the “Other” through the Gorilla, an animal that is almost human, but not quite. 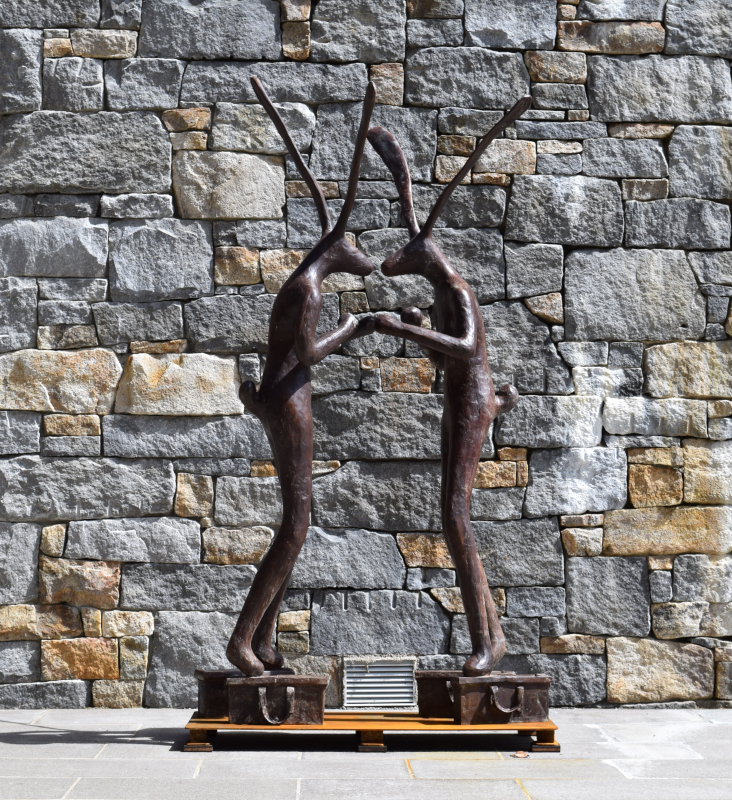 In his expressive sculptures, Lionel Smit focuses on the residents of Cape Town, South Africa, creating portraits both representational and abstract. He frequently presents the women, of the Cape Malay community as subjects. Smit cites Francis Bacon, Andy Warhol and Lucien Freud as influences, for their use, in his words, of “the human portrait to create something extraordinary.” Often working at monumental scale, his sculptures evince this blend of naturalism and abstraction, with their heavily modeled and fragmentary surfaces. For Smit, this form of portraiture gets beneath the skin to reveal the multifaceted nature of his human subjects. Shany van den Berg’s artwork is deeply tied to her autobiographical experience as a woman, mother and artist. Renowned for her technical acumen, subtle symbolism and agility to depict figuration and abstraction, she utilizes layers throughout her work. Layering, both physically and metaphorically is clearly evident in Die Kop. Van den Berg started her career as a nurse and she draws on this personal history with the materials she uses. Here we see the medical bandages she painstakingly wraps and ties around the model head. Based on a replica of a standard “universal” medical model head, Die Kop has been scaled to a massive size. Viewers of the work may observe themes of identity, healing, subjectivity and connectedness. Allan Houser was a 20th century American artist who addressed his Native American heritage through painting and sculpture. Houser’s family belonged to the Chiricahua Apache tribe, hunter-gatherers who roamed from northern Mexico to New Mexico. “I was twenty years old when I finally decided that I really wanted to paint. I had learned a great deal about my tribal customs from my father and my mother, and the more I learned the more I wanted to put it down on canvas. That’s pretty much how it started,” he said. Houser combined traditional themes with Modernist aesthetics, crafting a unique abstract-figural style. He moved to Los Angeles during World War II, where he was introduced to the works of Henry Moore, Constantin Brancusi, and other European artists who would influence his practice. There is an element of irreverence in all of Guy du Toit’s work, whether he is casting everyday objects like plastic cups or skulls, or sculpting his quirky, rambunctious hares. 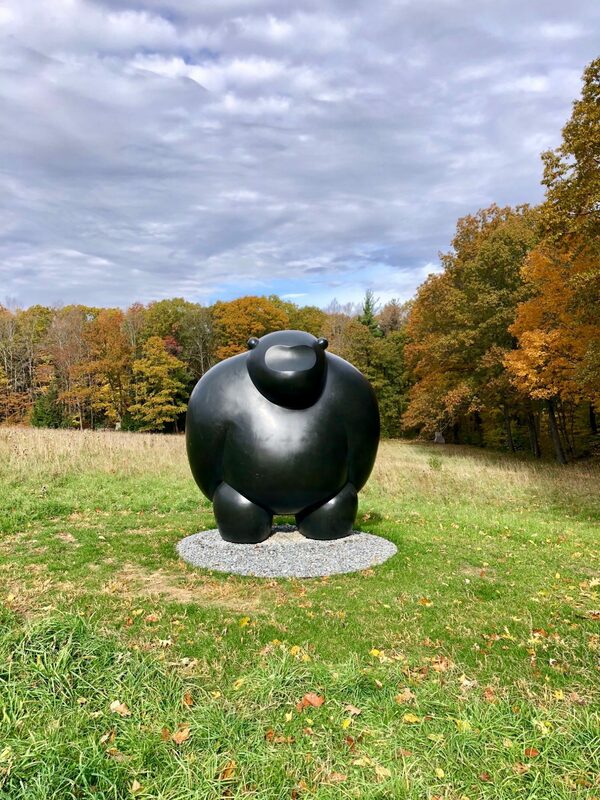 While his earlier pieces show a keen interest in formalism, in the play of shape and shadow, his hares have built on his use of objects as symbols to become his most recognizable work, with their strong sense of character and subjectivity rather than object-hood. Hares and their cousins rabbits have long been symbols of life and energy, death and rebirth, often with a close link to the moon, which Du Toit acknowledges in his work. His long-eared anthropomorphs engage in human behaviors such as fighting, dancing, climbing stairs, drinking wine or (cheekily) urinating against a wall.